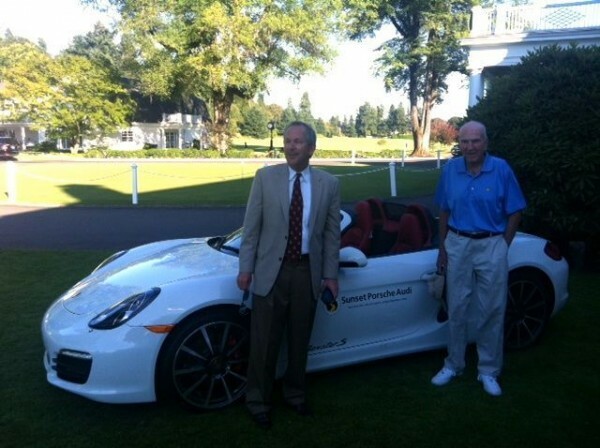 37 years ago Peter Jones was a student at the University of Oregon when his father gave him a Buick Skylark he won for getting an ace on the 6th hole during a member-guest tournament at the Waverly Country Club in Portland, Oregon. Two weeks ago Jones, now 58, was playing in a member-guest tournament at the same club when he aced the exact same hole his father did. This time, however, the prize was a Porsche! Peter Jones, and his father Sheldon, posing with the Porsche Peter won. This isn't the first hole-in-one for Jones. In fact, he hit his ninth ace on the ninth hole of the course while practicing for the tournament. Two days later, he used a 7-iron to tee off on the 157-yard sixth hole and earned the 10th hole-in-one of his amateur career and a new Porsche Boxster. According to the story we read, the course recently went under a "significant renovation". However, the sixth hole was pretty much left alone. Other than a few changes to the bunkers the green and everything else was unchanged. This means the Joneses both won cars with aces on a hole that played the same 37 years apart. I wonder if he'll give the Porsche to his father? What a great heartwarming story! It would be even better if he gave his father the Boxster. Maybe I need to take up golfing.